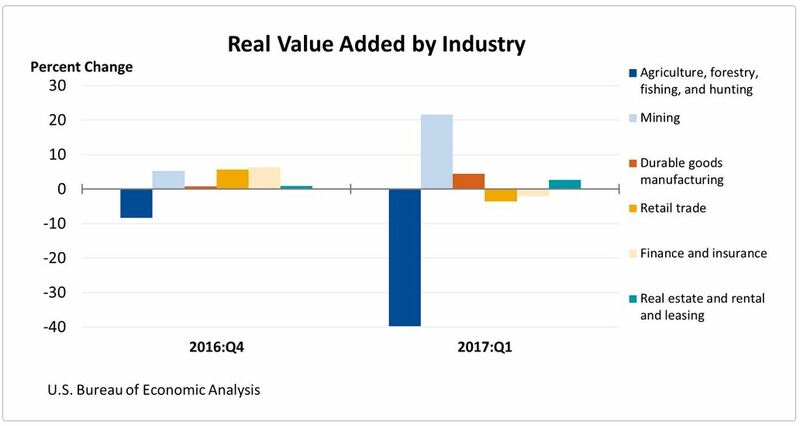 (CNSNews.com) - The real value added to the U.S economy by the mining, construction and manufacturing sectors boomed in the first quarter of 2017, while the real value added by the financial and insurance sector dropped, according to data released today by the Bureau of Economic Analysis. Overall, the U.S. economy grew at an annual pace of only 1.4 percent in the first quarter. But the value added by mining grew by a booming annual rate of 21.6 percent, while construction grew 5.6 percent and manufacturing grew 4.7%. The BEA says that the value added by an industry—which equals the market value of the goods, services and structures it produces minus the values of the goods and services it consumes in production—is “a measure of an industry’s contribution to GDP." The overall 4.7 percent growth in manufacturing reflected 5.0 percent growth in manufacturing of nondurable goods (i.e. products such as clothing and food) and 4.4 percent growth in the manufacturing of durable goods. At the same time that mining, construction and manufacturing were booming, the finance and insurance sector declined by 2.1 percent. Among other industries that declined during the quarter, according to the BEA data, were agriculture, forestry, fishing and hunting (-39.8%); utilities (-6.4%); retail trade (-3.6%); and arts, entertainment, recreation, accommodation, and food services (-0.9%).